This article explains how to add our libraries to a remote Jupyter server acting as central hub for multi-user notebooks on your network. Jupyter Notebooks is distributed with Anaconda, which is the Python distribution used by Machine Learning Server. If you installed Machine Learning Server, you have the components necessary for running notebooks as a single user on localhost. Both Machine Learning Server and Jupyter Notebooks must be on the same computer. This procedure applies to Linux or Spark edge node upon which you are hosting a JupyterHub or multi-user server. It does not apply to single-user localhost servers. For a multi-user server, add our custom kernel MLSPython to the data directory of your server. Machine Learning Server provides this kernel for notebooks and scripts that make calls to revoscalepy, microsoftml, and azureml. If the /usr/bin/anaconda/bin/jupyter folder doesn't exist, then the server is not a JupyterHub or multi-user server. For more information, see JupyterHub documentation. Verify the file is in the expected location. Run jupyter –-data-dir from the node on which Jupyter Notebook Server is installed. Note the path returned by --data-dir. This is where Jupyter stores its data directories, including kernels. Navigate to the folder. You should see MLSPython listed. If the installation command did not succeed, you can manually copy the MLSPython directory from /opt/microsoft/mlserver/9.3.0/libraries/kernels/ to the kernels subdirectory under the data directory. You might need to restart your server in order for the server to pick up the kernel. 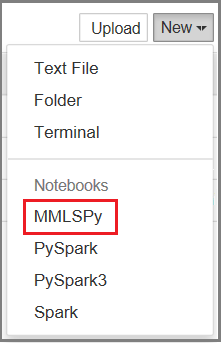 In Jupyter dashboard, click New to create a new notebook. You should see the new kernel (MMLSPy) in the drop down.